In most cases, ISO calibrations which fulfil the requirements of the various standards and are traceable to national standards are sufficient. 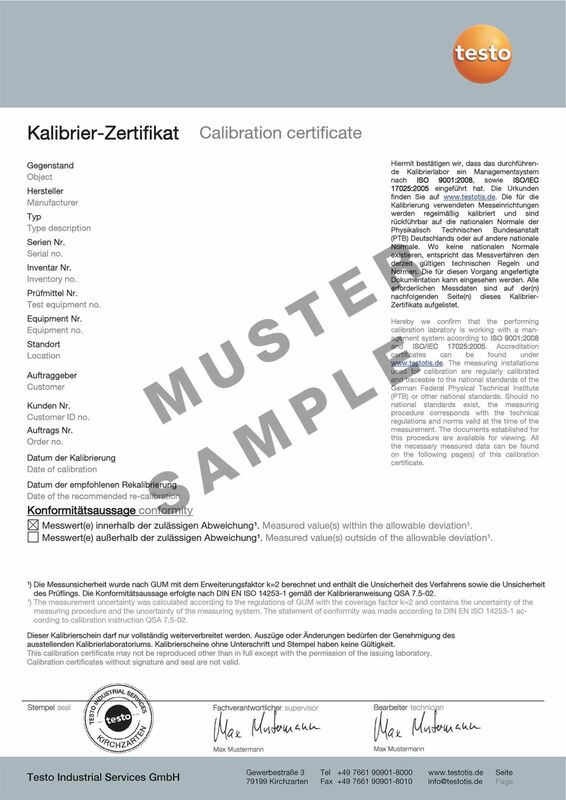 What are referred to as ISO certificates are then issued for these calibrations. With this ISO calibration certificate for temperature, your measuring instrument or probe is calibrated at the following points: -18 °C, 0 °C, +40 °C. Please note: the price for this ISO calibration refers to one channel per measuring instrument. If you wish to calibrate a measuring instrument with two probes, for example, you need to order two ISO certificates. If you require ISO calibration at other calibration points, please contact us directly. We offer other ISO calibration certificates. ISO calibration certificate for temperature with the calibration points: -18 °C, 0 °C, +40 °C.